An artist's concept of the QuetzSat-1 directo TV broadcast satellite in orbit. PARIS — The QuetzSat-1 satellite, which satellite fleet operator SES is counting on to deliver a quick contribution to revenue, launched into orbit on Sept. 29) aboard an International Launch Services (ILS) Proton rocket, SES and ILS announced. 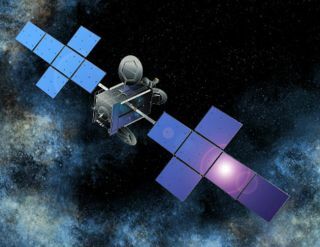 EchoStar has leased the entire capacity of QuetzSat-1 — 32 Ku-band transponders with 20 kilowatts of power — to EchoStar for 10 years to provide broadcasts in Mexico, the United States and Central America. The satellite is thus fully leased, and will begin generating revenue for SES, as soon as it completes in-orbit testing. It is a key component of SES's major expansion program currently under way. A Russian-built Proton rocket launches the new QuetzSat-1 satellite into orbit from Baikonur Cosmodrome on Sept. 30 (local time) in 2011 in this still from an International Launch Services broadcast. The 5,600-kilogram QuetzSat-1 was built by Space Systems/Loral of Palo Alto, Calif., and was financed through a direct loan from the U.S. Export-Import Bank. The loan, valued at $171.5 million, paid for the satellite’s construction and for a portion of its insurance coverage, arranged by Aon of Chicago. The launch was the second flight of the Proton M/Breeze M vehicle, but the first ILS commercial flight, since the rocket’s Aug. 18 failure to deliver a large Russian telecommunications satellite, Express AM4, into the correct orbit. The satellite, insured for around $300 million, has been declared a total loss. The failure’s cause has been traced to a flight-programming error.